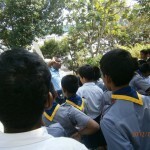 Golden Scouts took time off, from their usual scouting activities on 29th of February to visit the Sri Lanka Air Force Museum in Ratmalana. This outing was organized by the Gold Troop with the assistance of the Royal College Old Scouts Association for February’s Scouter a day programme. The scouts got the privilege of being guided by an Air Force personnel & the two hour tour inside the museum was really exciting. Not only that the scouts got to see the air crafts used in the past but they also got the opportunity to see the air crafts that were used in the war against the terrorists and the air crafts of the Sri Lanka Air Force & of the terrorists that were damaged during the war. Also the guide explained the technical aspects of the air crafts that were on display. However the most enjoyable & the interesting part of the tour for the young scouts was the two opportunities they got to feel what it is like to fly in an air craft by going in a journey over the city of Colombo in two artificial air crafts that were set up in the museum!